A crisp, juicy apple famous for sauce and baking, and it is also good for fresh eating. An early bloomer, ripens early in the season. It is green with red striping. 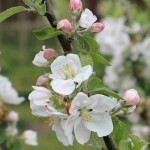 Does not pollinate other apples and requires a pollinizer: Fuji, Gala, Empire, or Red Delicious. Budded on semi-dwarf rootstock. It needs full sun and a well-drained soil.